That competition, for shooters ages 8-13, will be held Saturday at Westbrook High School and will include state champions from New Hampshire, Connecticut, Rhode Island, Massachusetts and Vermont. 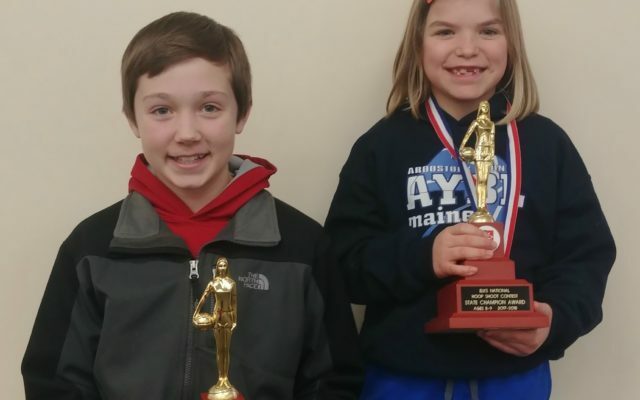 The regional winners from the six divisions — Girls 8-9, Boys 8-9, Girls 10-11, Boys 10-11, Girls 12-13, Boys 12-13 — advance to the Elks Hoop Shoot National Finals, which are scheduled for April 21 in Chicago. Sjoberg, 13, and Tardiff, 8, both represent the Presque Isle Elks Lodge 1954. Sjoberg, the ages 12-13 champ, won the regional championship last year by making 24 of 25 free throws and earned the Walter Kettelle Award for having the best performance among the three age divisions. She placed third at last year’s national competition, also held in Chicago, after placing fifth at nationals in the 10-11 division the previous year. Wyatt Folsom of Augusta Lodge 954 was the boys winner in the 12-13 age group. Tardif won the ages 8-9 girls title and Chase Ross of Farmington, representing Elks Lodge No. 2430, was the 8-9 boys champion. Harry Louis and Alison Griffeth, both of whom represent Skowhegan-Madison Elks Lodge No. 2531, were the ages 10-11 state winners.